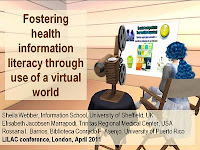 In Second Life, the virtual world, Elisabeth Jacobsen Marrapodi, Library Director, Trinitas Regional Medical Center, New Jersey (USA), Rossana I. Barrios, Biblioteca Conrado F. Asenjo, University of Puerto Rico and I will be giving a presentation: Fostering health information literacy through use of a virtual world (in SL we are Brielle Coronet, Pi Illios and (me) Sheila Yoshikawa). You need a SL avatar and the SL browser installed on your computer to participate. 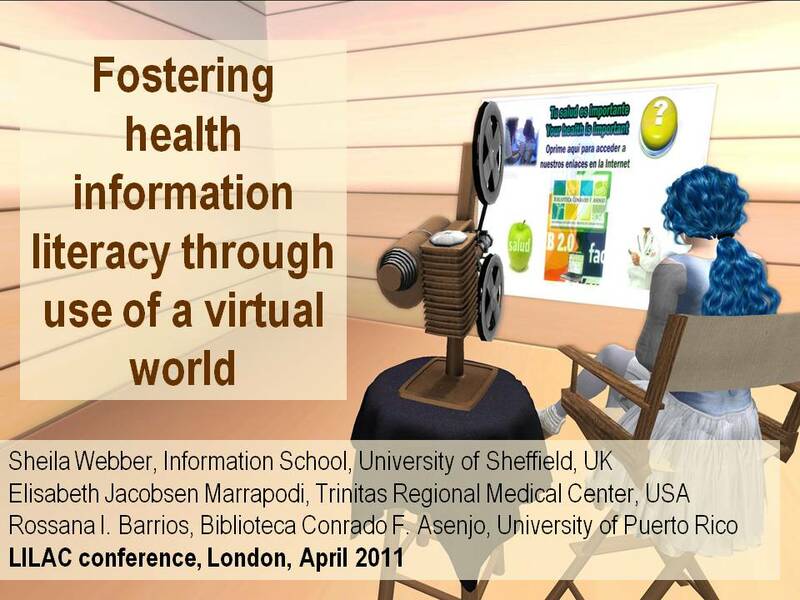 This is the presentation that Elisabeth Marrapodi and I will be delivering in London at the LILAC conference the following week (we will put the powerpoint online at that point). This is a one hour session, with presentation in voice and discussion in text chat.